This one is for the current Picture Perfect Creations - Color Combo - Night of Navy, Crumb Cake and Whisper White. I added a little red satin ribbon just to add some brightness. Hope you like it! 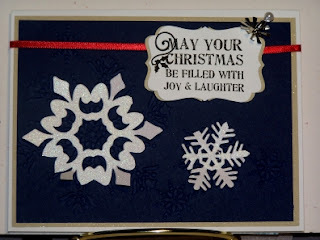 I embossed the Night of Navy with my NEW ef from Stampin' Up! Northen Flurry, isn't it lovely!!! I had to find some way to cool off in this scorching Texas heat! Beautiful card Betty!! Ahhh, Christmas in July! Love the touch of red too. Thanks for joining us at PPC.